We are completely involved in providing an exclusive range of superior quality Counter Digital Photo Electric Control Panel to our prestigious clients. Owing to its features like reliable operation and flawless finish, it is widely appraised by our clients. The offered panel is widely used for controlling different systems in various industries. 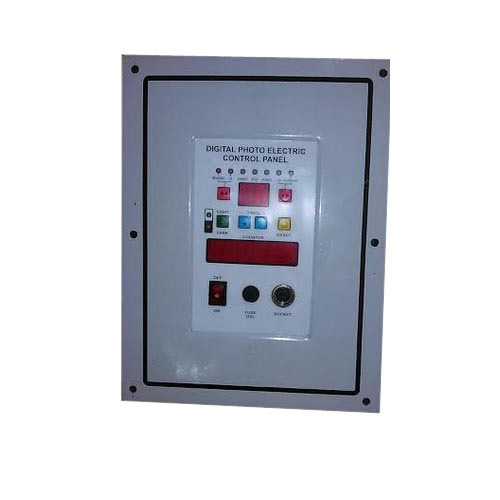 Using premium quality basic material and progressive technology, this panel is manufactured by our dexterous professionals at par with set quality standards. Established in the year 2012, we “Alpha Control Systems”, are affianced in manufacturing and supplying a commendable collection of Coding Controller, Auger Controller, Candy Control Panel, Machine Photocell, Control Panel, etc. Situated at Faridabad (Haryana, India), we are a Sole Proprietorship Company and constructed an ultramodern infrastructural base. This unit assists us in manufacturing world class control panel as per the industry set norms. This unit is further divided into sub-departments like quality testing, R&;D, sales, admin, marketing, procurement, production, warehousing, transportation, packaging, logistic, etc. Managed under the direction of our dedicated team members, all these departments are well resourced with the latest machines and equipments. Besides, we are highly appreciated in the market due to our ethical business policies, reasonable rates, quality-focused approach, wide distribution network, etc. We are providing our products under the brand name Alpha Controls.